It’s Black Friday, a traditional day of shopping. But I’m still thinking about yesterday — Thanksgiving. So I’ve decided to share two books that I’m thankful I read this year. They’re picture books, and they’re very different in what they do and why it works. I discovered them both recently when I attended the National Council of Teachers of English (NCTE) convention in Houston. 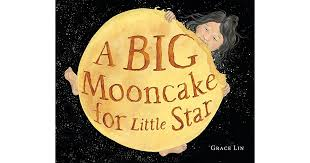 A BIG MOONCAKE FOR LITTLE STAR written and illustrated by Grace Lin. This book is flat-out gorgeous. The title is perfect. Check out the contrast between big and little and moon and star. If there were a hall of fame for effective picture book titles, this title would be inducted immediately. Then, there’s the story. Little Star and her mom make a huge mooncake that they store in the sky. Little Star’s mom asks her to please not eat it yet, and Little Star agrees. But it just looks so good. Surely one tiny taste would be OK. But is it? Then, there’s the art. The art. This is some of the loveliest art I’ve seen in a long time. Every page has a glossy black background with Little Star, her mother and the mooncake glowing luminously on top of it. I really want to know how it was created. If I ever meet Grace Lin, I’ll have to ask. This is a book I wish I could have read to my daughters when they were small. Maybe they’ll humor me and let me do it now. 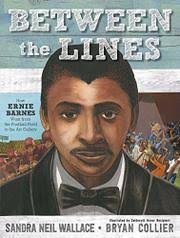 BETWEEN THE LINES written by Sandra Neil Wallace and illustrated by Bryan Collier. Sometimes, I forget what a tactile experience picture books are. You hold them and turn each page, so the feel of the book is important. This book feels great. It’s a larger size — 12 inches tall by 9.25 inches wide. And the dust jacket is this amazing mix of rough, textured paper and super-shiny paper. It’s a delight to hold. This book tells the true story of Ernie Barnes, a professional football player and artist. It’s a compelling, well-told tale about someone I hadn’t heard of previously. And, it didn’t go the way I expected it to. This is a beautiful book to look at, as well. Bryan Collier includes some of Ernie Barnes’ actual art in his illustrations, It recently won the Orbis Pictus award for best nonfiction children’s books and once you read it, you’ll see why. I hope you’re able to check these out when you’re shopping on Black Friday or Small Business Saturday or Cyber Monday. Which picture books are you happy to have read this year? Fiction, nonfiction picture books, Pat Zietlow Miller. Bookmark. Geraldine by Elizabeth Lilly is a Whimsical Treat! Thanks. Anything Grace Lin does is gold. And I can’t wait for a ‘feel good’ book. Both are on order! I can’r wait to read the Ernie Barnes book, Jill. Ive been grateful to read SWATCH again as a mentor text. YOu’ve made me want to pick up MOONCAKE, too. I love the Michelle Cusolito’s FLYING DEEP. I’m still all about gratefulness, too. Ty of sharing these two books. I have read Sandra Wallace’s BETWEEN THE LINES, and loved it. It’s always great to see a spotlight on a deserving person who has been in the shadows far too long. Thank you, Pat, for your enthusiastic introductions to these books. I can’t wait to read them! 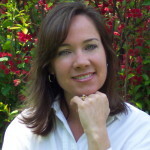 Answering your question: NIGHT JOB by Karen Hesse and WHAT IF . . . by Samantha Berger. I go to the library and devour 25+ picture books at a time. Pat, few were stellar this year like your BE KIND. . . . I have always loved picture books and have used a few effectively as high as fifth grade. Both of these books look amazing! Thank you for sharing! I am happy to have read many new picture books this year…too many to name. I’m sure these two will also be added to my list! Picture books are tactile. I’ll have to make sure I read these two. I’m excited for BETWEEN THE LINES also, and now BIG MOONCAKE FOR A LITTLE STAR. Thanks for the recommendations. Both of these look like great reads! I’ve read sooo many good books this year. One of my new favorites is THE ROUGH PATCH, though it’s about grief. The illustrations just really make the story come to life and give hope to a rough life event. This year, I’m happy to have read “Alexander Graham Bell Answers the Call” by Mary Ann Fraser, “Hello Lighthouse” by Sophie Blackall, and “Adrian Simcox Does Not Have a Horse” by Marcy Campbell and Corinna Luyken. Thanks for sharing these gorgeous books Pat! Can’t wait to check them out in person.